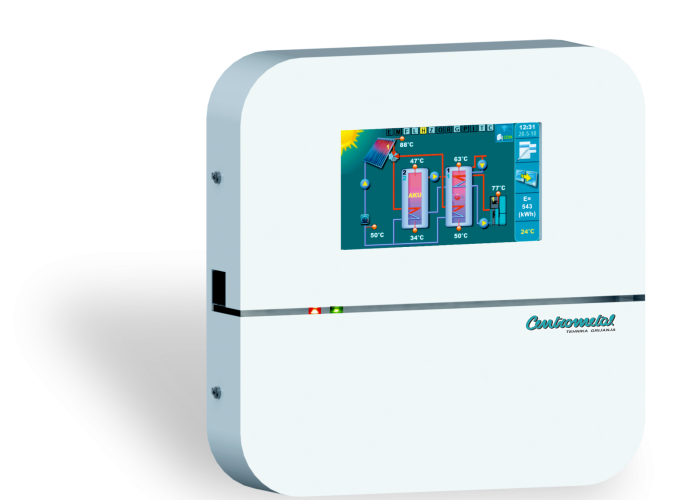 Solar controller Cm-SOL is intended for heating the DHW tank, accumulation tank (with or without built-in DHW tank) or swimming pool through solar collectors and / or boilers and / or el. heaters. The controller can control heating up to 4 different tanks / swimming pool that can be heated up to 2 separate hot water solar collector fields and up to 2 types of conventional source (boilers) or el. heater. Pumps to collector can be operated with PWM or analog signal. In addition to the temperature sensors, on controller is possible to connect the flow meter and the pressure switch. 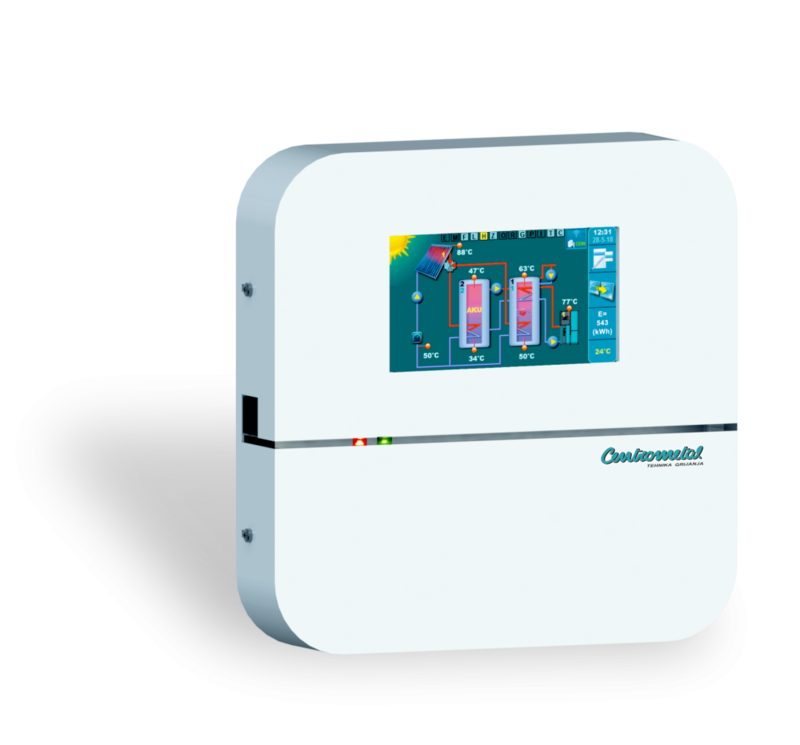 With standard tank heating control over temperature difference, controller has protective functions such as collector cooling (over tank), collector antifreezing options, tank cooling (over collector or recirculation), legionella protection (disinfection function) and protection of outlets (pumps and valves ) of blocking due to long-term non using time. All functions are controlled through a colour touch screen that simplifies the use of controller. As an additional equipment, a Cm WiFi-box can be connected to controller via which it is possible to connect controller to the local WiFi network for remote control and monitoring of the system. CmSOL controller can control solar heating up to 4 separate tanks with 1 or 2 solar collector fields and heating the first tank using conventional sources – an el. heater and up to two boilers. Controller has 10 inputs, 8 outputs and 2 PWM and 2 analog outputs for collector pumps. Types of solar collectors can be chosen between flat plate and vaccum tube solar collectors. Types of tanks can be selected between DHW tank, accumulation tank, accumulation tank with built-in DHW tank and swimming pool. Hydraulic connection of the multiple tanks can be selected via pumps, 3-way zone valve and 2-way zone valve. It is possible to control the pump for heating the first tank with the next one (heating the DHW tank with the accumulation tank). The first tank can be heated by an el. heater (via contactor) and with up to 2 conventional heat sources. The controller can control the recirculation pump with impulse operation at the set schedule time. By entering the correct flow through the solar collectors and by installing the solar collector backflow sensor, sollar controller calculate total gain energy from solar collectors. If the flow meter is installed, the calculation of the energy will be more accurate. In addition to the upper mentioned, the controller also has protective functions: solar collector cooling function (via tank), tank cooling function (over solar collector or recirculation), disinfection function (legionella protection) and pump/valve protection function for blocking protection. On the controller you can determine the priority of solar heating of a single tank, switch on a tank heating priority test, switch on/off certain tank from the heating, switch on one-time heating with conventional sources, switch on party option for one-time heating extension and switch on the holiday option with which are automatically switch on all protective controller functions to allow the overheating/freezing of the collector to be minimized. To monitor the operation of the solar system, it is possible to install a Cm WiFi-box and through the web portal monitor the individual temperatures and operation of individual pumps and valves. Through the web portal it is also possible to change the set temperatures of the tank and solar collector.